Rails are available in three different materials and five different sizes to meet your specific material handling needs. The enclosed Rail Systems design reduces the accumulation of dirt and grime on the internal rolling surfaces, which reduces rolling effort. Combine rail systems with air balancers and end effectors to create a versatile, efficient material handling system. 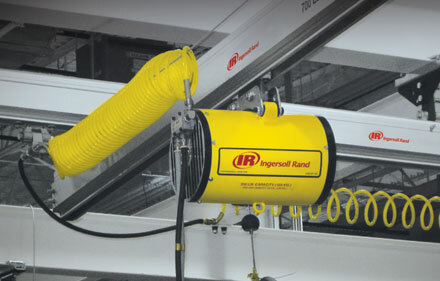 Rail and balancer system, underhung from ceiling supports does not occupy valuable floor space. 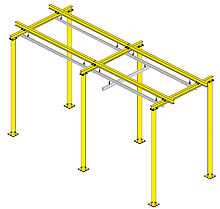 Steel structure for floor support allows you to place a bridge crane anywhere you have a physical footprint regardless of ceiling structure. Lightweight and available for long spans. Strong, economical choice, ideal for heavy weight applications. Engineered for clean room applications, ideal for the food and pharmaceutical industries. 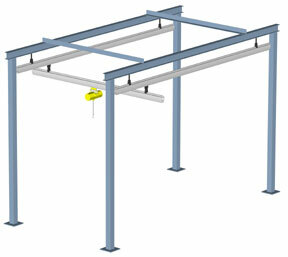 We offer a wide variety of hangers to attach to virtually any type of overhead steel. Available in either rigid or pivoting styles, to match the material handling operation. We offer both articulating and rigid end trucks, but primarily focus on articulating models. This feature maximizes the ability of the user to precisely position loads by allowing them to move only the portion of the bridge crane near the load. Trolleys are designed to work in conjunction with the enclosed track rail to reduce the rolling effort required to move a load. In fact, a force equal to only 1% of the total rolling weight is needed to move a load.